World Environment Day, celebrated every 5th of June and hosted by United Nations Environment Programme (UNEP), promotes eco-action and environmental protection. This year's theme "Beat Plastic Pollution" is very close to my heart as we try to minimize our single-use plastic consumption. In line with this year’s theme, UNEP is encouraging individuals and communities to take action by focusing on the plastics that go into our natural waterways. Plastic is one of the biggest pollutants in our oceans today. Every year, the world uses 500 billion plastic bags; every year, at least eight million tons of plastic end up in the world’s oceans—the equivalent of a full garbage truck every minute—damaging marine life and threatening human health. The amount of garbage that end up our waters is growing, and experts predict that the annual amount of plastic trash tumbling out to our seas, oceans and rivers will more than double in the next 10 years. LG Electronics celebrates World Environment Day by rallying 40,000 employees all over the world to take action and become agents of positive social change. They have been doing this for 9 consecutive years. 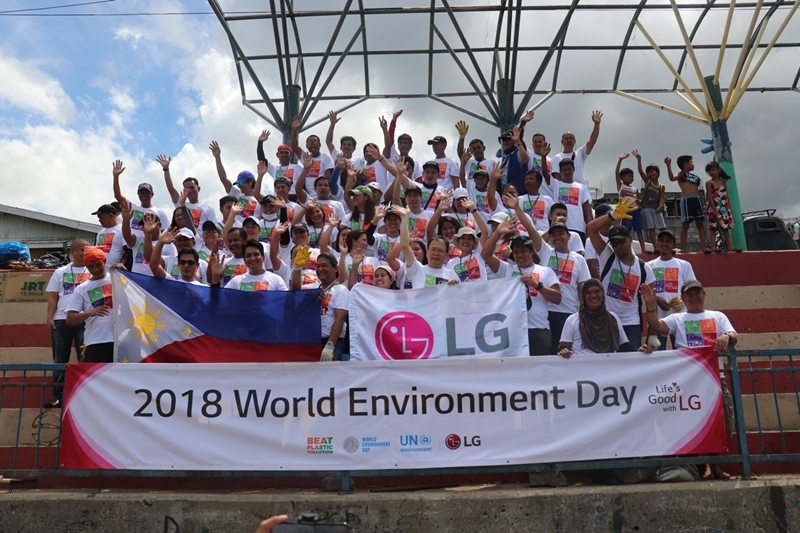 This year, LG Electronics heeded UNEP’s call for citizens and companies to organize and participate in coastal and riverbank clean-ups, and arranged a 24-hour “relay” event where its offices across the globe engaged in a clean-up activity benefiting the local community. The event occurred on May 24 with the team from LG Electronics Philippines kicking off the relay. According to a study, the Philippines is the third biggest source of plastic ocean pollution in the world. To help offset this reputation, LG Philippines provided assistance to the Pasig community, where its office and warehouse is located, by helping in the weekly clean-up and rehabilitation of one of the more polluted areas along the Pasig River. 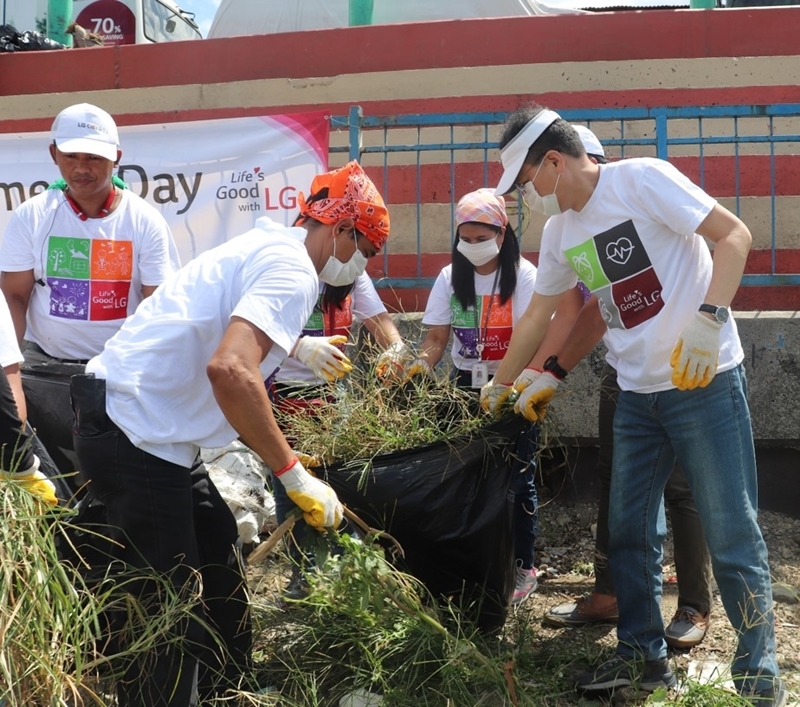 Forty-five employees, including LG Philippines Managing Director Inkwun Heo, rolled up their sleeves and tirelessly gathered waste such as plastic bottles and caps, plastic packaging, cans and even old toilet seats. The LG employees were joined by 30 volunteers from the Solid Waste Management group of the Pasig City government. More than 50 large bags of garbage and waste materials were collected from the site. After the activity, the cleaning materials purchased and used by LG’s employees, such as gloves and rakes, were donated to the Solid Waste Management group of Pasig City. LG is also committed to promoting a sustainable and eco-friendly lifestyle by offering a range of innovative home appliances designed to counteract a number of environmental threats. LG’s eco-friendly initiatives are at the forefront of the ongoing revolution in renewable power, increased energy efficiency and environmentally friendly production.